Charles Davis is my 4th great-grandfather on my mother’s side [Virginia Lineberry > Jacob Lineberry > Rhoda Harmon > Delila Davis > Morris Davis > Charles Davis]. I knew nothing about him other than his and his wife’s name, a birth date and an approximate death date and location. Early spellings of the last name were Davies. Culled from the book, an article on the Flower Swift Militia of Montgomery County, Virginia, some pages from a book written by Carroll County, Virginia native John Perry Alderman called, “Carroll the Settlements: 1765 to 1815,” and a number of different Quaker record books, I learned a good bit about Charles Davis. 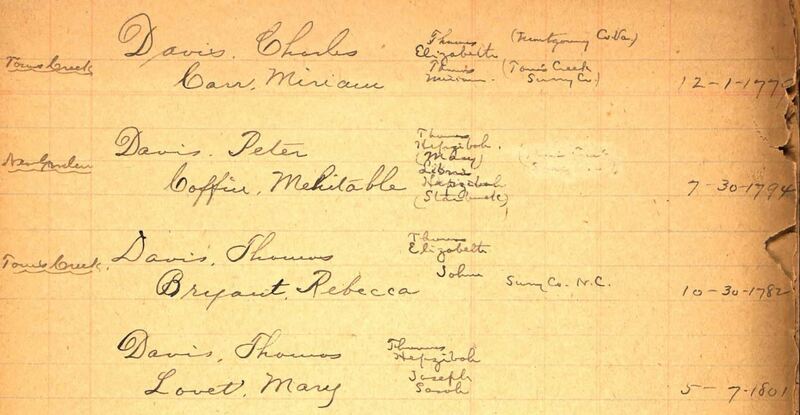 Charles was born in Cane Creek, Orange, North Carolina on April 5, 1759 to Dr. Thomas Davis and Elizabeth Knox. He was the oldest of twelve children. His parents had migrated from Pennsylvania to Delaware to Virginia to North Carolina along with several of their Chester County, Pennsylvania neighbors, all of whom were Quakers. When a Quaker family wanted to move to a new location, they approached their local Preparative Meeting or Monthly Meeting to ask for a certificate of removal to another meeting location. That certificate would then be presented to the new location. These requests were recorded in the record books, which is how this family was able to be tracked. About 1771, the Davis family along with several other families from the Cane Creek and New Garden Monthly Meetings moved to what was Montgomery County, Virginia [Montgomery included present day Wythe County, Tazewell County, Montgomery County, Grayson County and Caroll County] in the vicinity of Chestnut Creek. 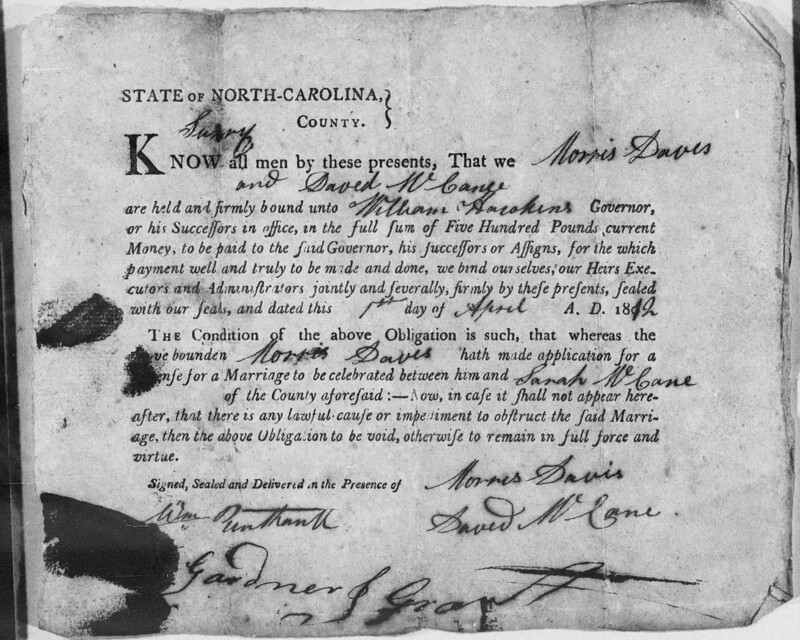 Charles married Miriam Carr at Tom’s Creek Meeting in Surry County, North Carolina. 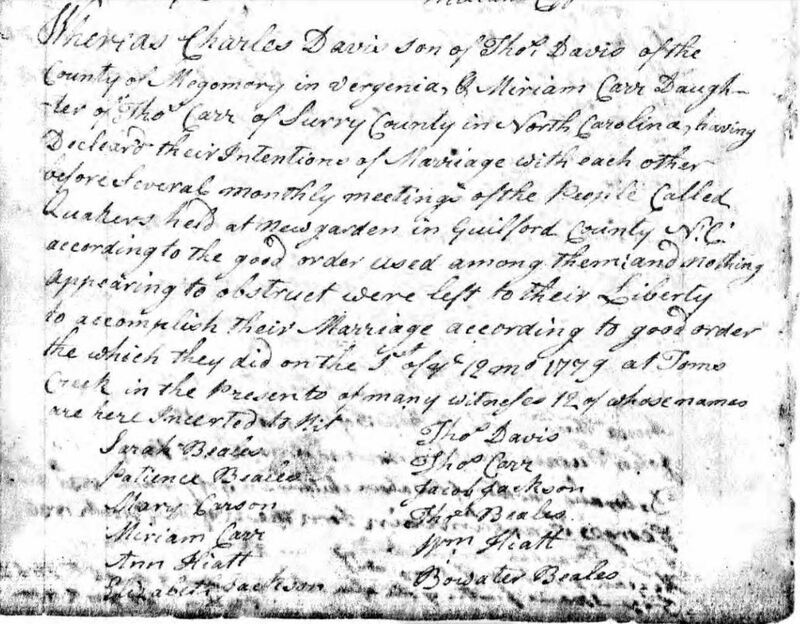 The record below names the couple as well as their parents and gives the marriage date of December 1, 1777. Charles and Miriam moved to Washington County, Tennessee; I don’t have sufficient information to know when they moved but he was counted there in an 1814 and 1819 tax list. Some family historians suggest he died there about 1823.